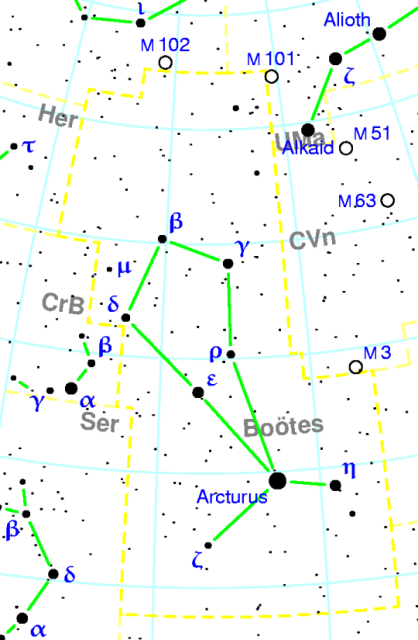 Arcturus, Alpha Boötis, is the brightest star in Boötes constellation and the fourth brightest star in the sky. Arcturus is only slightly brighter than Vega, the second brightest northern star. It is the third individual brightest star in the sky because it outshines the individual components of the Alpha Centauri system. It lies relatively close to Earth, at a distance of only 36.7 light years from the solar system. Arcturus has an absolute magnitude of -0.30 and is one of the most luminous nearby stars, along with Sirius and Vega. Arcturus is the brightest class K giant in the sky. The name Arcturus is derived from the Greek Αρκτοῦρος (Arktouros) or ἄρκτος (arktos) and οὖρος (ouros), meaning “Bear Watcher” or “Guardian of the Bear,” referring to the bear represented by the neighbouring constellation Ursa Major. Arcturus is believed to have run out of the hydrogen supply in its core and is in its active hydrogen shell burning stage. The star will continue to expand in size and eventually enter the horizontal branch phase of its evolutionary cycle. It will likely end its life cycle by ejecting its outer shell and leaving behind a white dwarf surrounded by a planetary nebula. The star’s estimated age is 7.1 billion years, possibly up to 8.5 billion years. 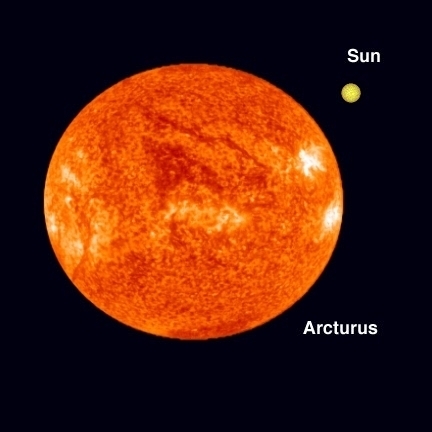 Arcturus is about 113 times more visually luminous than the Sun, but taking the star’s infrared emission into account, it has a luminosity 180 times that of the Sun. Arcturus has a near-infrared J band magnitude of -2.25, making it dimmer only than Betelgeuse (-2.9) in Orion and R Doradus (-2.6) in Dorado constellation. Arcturus does not have any known planets or confirmed substellar companions. 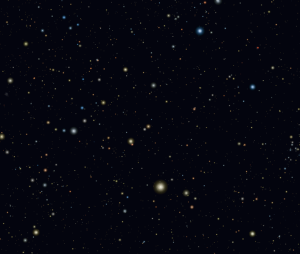 The presence of a substellar object with almost 12 times the mass of Jupiter, lying at a distance of 1.1 astronomical units from the star, was suspected in 1993, but has not been confirmed. Arcturus is very easy to find in the night sky. It lies less than 20 degrees north of the celestial equator and can be seen from both hemispheres. It can be located by following the arc of the Big Dipper‘s handle. It is the first bright star that appears along the imaginary line extending from Alkaid in the direction opposite to the Big Dipper. The same imaginary line leads to the bright star Spica in Virgo constellation. 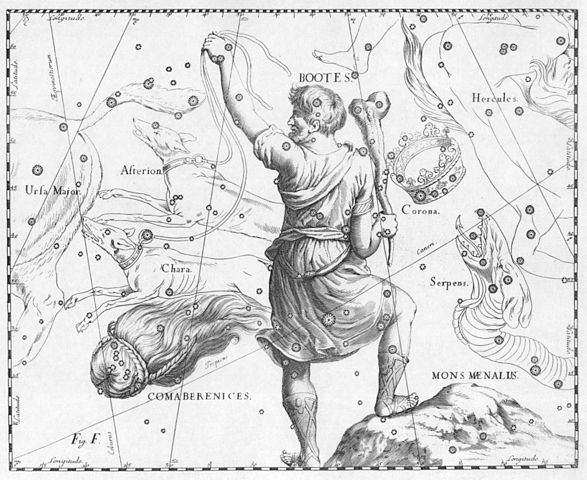 Alpha Boötis culminates at midnight on April 27 and around 9 pm on June 10. The best time of year to observe the star is in the late northern spring or southern autumn. 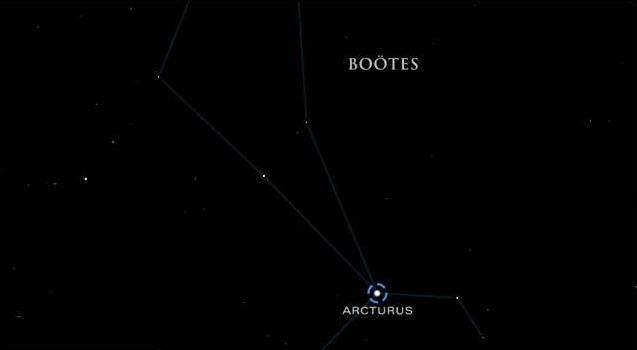 In the northern hemisphere, Arcturus is visible for at least some part of the night throughout the year. Arcturus was the first star other than the Sun to be observed in the daytime with a telescope. The French astronomer Jean-Baptiste Morin observed it in 1635. Arcturus can be seen with the naked eye just before sunset. Arcturus is slightly metal deficient, which suggests that it is a very old star, one belonging to an older population of stars, and one of the stars in the Milky Way’s thick disk. Population II stars like Arcturus make up only around 4 percent of all stars in the neighbourhood of the solar system. Arcturus and a group of 52 other old disk stars share a common proper motion. The group is known as the Arcturus Stream. 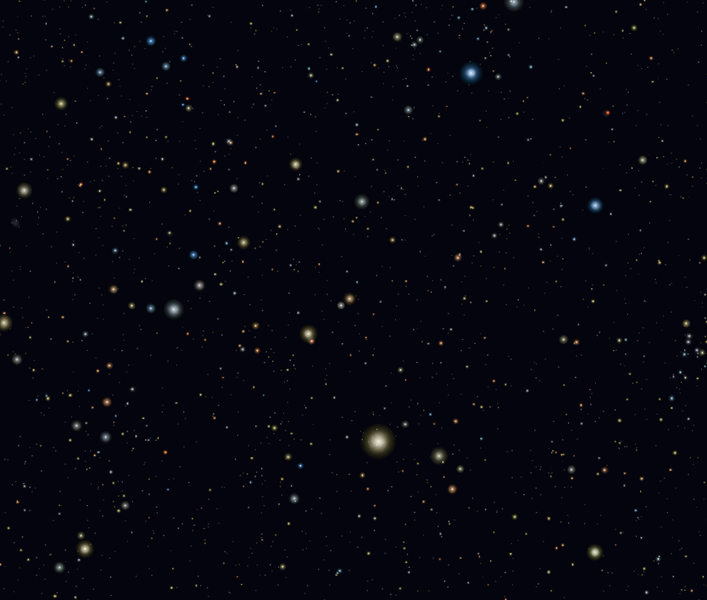 These stars don’t travel with the general stream of stars in the Milky Way’s disk. Instead, they are cutting perpendicularly across the disk. They are moving at a greater speed and at a different angle than other stars in the Milky Way Galaxy. For this reason, Arcturus will eventually move out of our line of sight. When it does, millions of years from now, Arcturus will be invisible to observers on Earth, or at least it won’t be visible to the naked eye. Arcturus was formed in our galaxy’s large spherical halo. It moves in an elliptical orbit, unlike the Sun, which moves with the galaxy’s plane. A different theory suggests that the stars in the Arcturus Stream may have entered our system as a result of the Milky Way colliding with a smaller satellite dwarf galaxy more than 5 billion years ago. Arcturus is believed to have come into our system about 500,000 years ago, and it will likely stay here for another 500,000 years before continuing its journey in the direction of the Virgo Cluster of galaxies. Muphrid, Eta Boötis, lies only 3.3 light years away from Arcturus. Seen from the Arcturus system, the star would have an apparent magnitude of -2.5. To an observer in the Muphrid system, Arcturus would appear as bright as Venus is to us. A radial velocity study of the star in 1988 revealed that Arcturus showed variability with a frequency of a few microhertz. 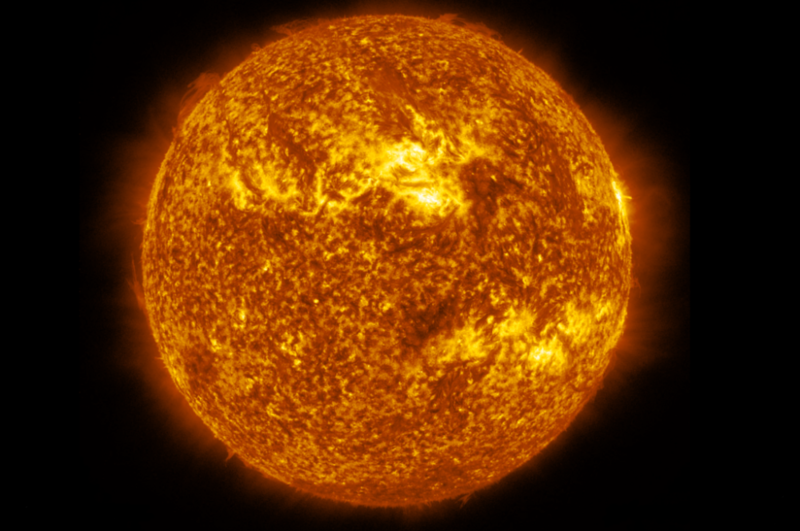 Astronomers believe that the star’s surface oscillates slightly, which is a common feature to red giants. Arcturus is not very red and it falls somewhere between stability and variability. It is classified as a New Suspected Variable (NSV) and has the designation NSV 6603. Arcturus has a very high proper motion. The star is moving at 122 km/s relative to the solar system. It has a larger proper motion than any other first magnitude star in our neighbourhood with the exception of Alpha Centauri. The star’s motion was first discovered in 1718 by Sir Edmond Halley. Arcturus will make its closest approach to the Sun in about 4,000 years. When it does, it will be a few hundredths of a light year nearer to the solar system than it is now. Alpha Boötis was significantly closer to the centre of the constellation in ancient times. The Greek astronomer Ptolemy described Arcturus as “slightly red” in colour. 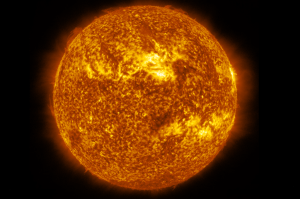 Ancient Romans believed that the star’s activity was supposed to portend tempestuous weather. Plautus’ comedy Rudens has a personification of Arcturus as the narrator of the prologue. The Chinese know Arcturus as Da Jiao, which means “the great horn.” It is the brightest star in the Chinese constellation Jiao Xiu, meaning “horn mansion.” Arcturus later became part of a different constellation, Kang Xiu. In Hawaii, Arcturus is the zenith star. In prehistoric Polynesia, the star was known as Hōkūleʻa, meaning “the star of joy.” Polynesian navigators used Arcturus to travel east and north in their canoes from Tahiti and the Marquesas Islands. As they crossed the equator, they arrived to the latitude at which the star would appear directly overhead in the summer months. If they kept the star directly overhead, they would arrive to the Big Island of Hawaii. To sail back to Tahiti, the navigators could use Sirius, the bright zenith star of their home island. The name Arcturus has been around since at least Hesiod’s time. The Greek poet mentioned the star in his book Works and Days, written around 750 BC. Arcturus appears in many works of fiction, including the novels A Voyage to Arcturus (1920) by David Lindsay, Fredric Brown’s What Mad Universe (1949), Isaac Asimov’s Foundation series (1951-), Gordon R. Dickson’s Arcturus Landing (1978), M.A.R. Barker’s Tékumel novels and games, Douglas Adams’ The Hitchhiker’s Guide to the Galaxy (1978-) novels, Superman: Last Son of Krypton (1978) by Elliot S. Maggin, Stanislaw Lem’s Return from the Stars (1980), and Jack Vance’s The Book of Dreams (1981). The star is also mentioned in many films, including Aliens (1986) and Spaced Invaders (1990), and television shows, including Buck Rogers in the 25th Century (1979-1981) and “The Curse of the Peladon” (1972) serial in Doctor Who. Arcturus also appears in a number of games, including Star Control II, Frontier: Elite II, Frontier: First Encounters, Escape Velocity Nova, and Mass Effect. The star was famously selected for the opening of the 1933 Chicago World’s Fair. At the opening event on May 27, 1933, telescopes focused Arcturus’ light on a few photoelectric cells, and used the current to switch on the floodlights and open the Century of Progress Exhibition. Arcturus was chosen because it was believed that the star’s light had started its journey to Earth at the time of the previous Chicago World’s Fair, held in 1893. In 1933, the star was thought to be 40 light years distant from Earth. Arcturus’ distance was later corrected to 36.7 light years, which means that the light had in fact started its journey from the star in 1896.